There seems to have been some carryover from the wet rainy season we had in 2016-17 to this year. The 2017-18 rain season was very dry — the third driest on record at Downtown Los Angeles — but seeps at Waterman Meadow, along the Burkhart Trail below Buckhorn were still wet. In general plant growth along trails has been more than I expected in such a dry year. Old growth Jeffrey pine killed in the 2009 Station Fire. Click for a closer view. Wet and dry periods can be seen in the growth rings of the large Jeffrey pine along the Three Points – Mt. Waterman Trail just west of the Twin Peaks Trail junction. A more careful count of its rings totaled about 500. No matter how careful the count, because of the various anomalies that occur with tree rings, some form of crossdating is usually required to confidently assess the age of a tree. Even so, it is clear this was an old tree. The first few miles of the loop were gloriously cool, but by the time I reached Cooper Canyon and was working up to Cloudburst Summit on the PCT, the sun beat down on me in a familiar refrain. 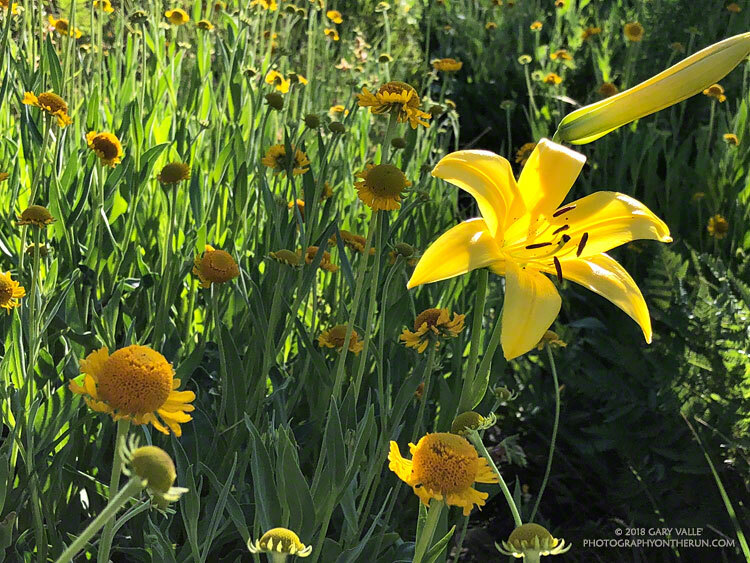 Here are a few photos taken on the loop. This morning’s run from Mt. Wilson started with striking views of the Southern California’s mountains from the Rim Trail. An extensive marine layer heightened the contrast between the highlands and the lowlands, with peaks such as Mt. Baden-Powell, Mt. Baldy and Monrovia Peak standing starkly above the ocean of clouds. Beyond Mt. Baldy, San Gorgonio Mountain could be seen, more than 75 miles distant. 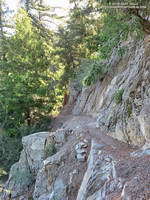 A section of the Rim Trail between Mt. Wilson and Newcomb Pass. The Rim Trail connects Mt. Wilson (5710′) to Newcomb Pass (~4100′). A trail and firebreak between Mt. Wilson and Newcomb Pass are shown in the 1934 “Advance Sheet” for the the first USGS 1:24000 map of the area, the Mt. Wilson Quadrangle. The route of the trail depicted in the finalized 1939 edition of the map is essentially the same as the Rim Trail today. The somewhat primitive and adventurous character of the Rim Trail makes it a favorite. Most often I run the Rim Trail as the first leg of a loop that follows the Gabrielino Trail down to Chantry Flat and then returns to Mt. Wilson on the Upper Winter Creek and Mt. Wilson Trails. There is still some Poodle-dog bush along the Rim Trail and also on the connector trail between the top of the Kenyon Devore Trail and the Mt. Wilson Trail parking lot. As long as you see it, it is easily avoided. Poodle-dog bush is a fire-follower — in this case from the 2009 Station Fire — that can cause contact dermatitis. 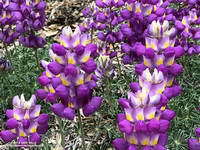 Here’s a closer look at the flowers. Today, instead of turning right at Newcomb Pass toward Chantry Flat, I turned left on the Gabrielino Trail, . This leads down to Devore Camp — an isolated trail camp along the W.F. San Gabriel River. (Think creek!) From Devore Camp the Gabrielino Trail is followed up-canyon to West Fork Camp and then to the Kenyon Devore Trail. The Kenyon Devore Trail is then used to get back up to Mt. Wilson. 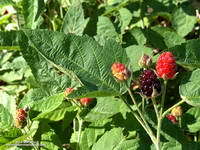 There are other variations as well. Some related posts: Mt. 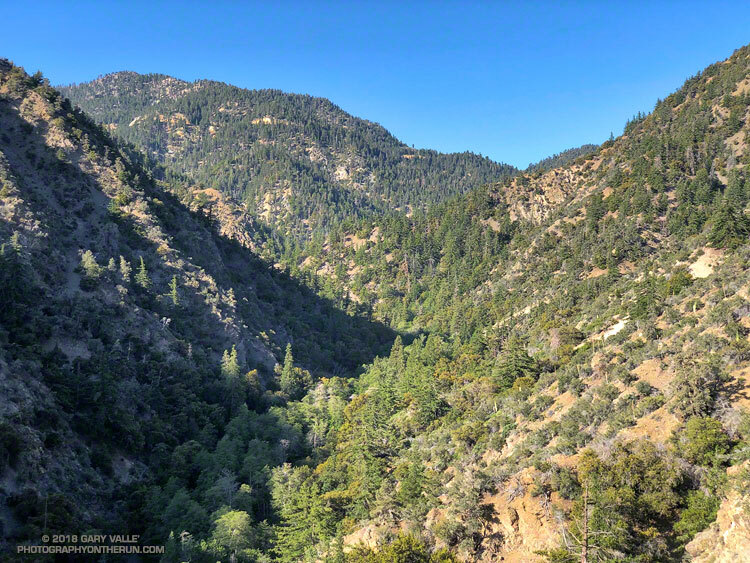 Wilson – Newcomb Pass – Chantry Flat Loop; Bigcone ENSO Prediction, Poodle-dog Bush Blues, and a Surprise on Kenyon Devore; Why Won’t My Smart Key Work? Given the choice of doing an out and a back run, or a loop, most of the time I’ll pick the loop. Loops encompass more terrain, incorporate more trails, offer more varied scenery, are more adventurous, and normally put you back where you started. 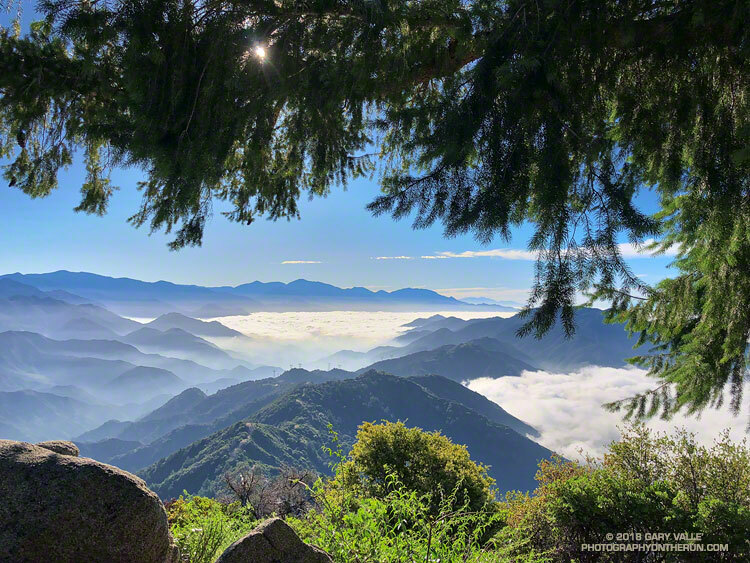 There are many excellent loops in the San Gabriel Mountains. Last week’s loop from Three Points around Mt. Waterman is a run I like to do a few times a year. 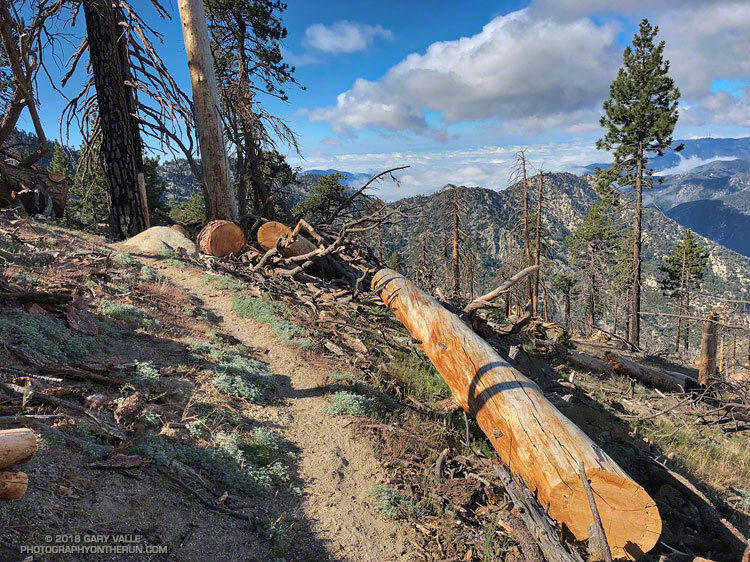 Today’s run is another favorite — the Islip Saddle – South Fork – Mt. Baden-Powell loop. This loop combines a demanding descent to the desert on the South Fork Trail with an arduous 5000′ ascent of Mt. Baden-Powell. From Baden-Powell the PCT is followed along the crest back to Islip Saddle. More info can be found in the related posts linked below. The weather was surprisingly cool for a Memorial Day weekend in the San Gabriel Mountains. At Three Points (5925′) the temperature was a brisk 43°F when I started my run, and it remained in the 40s as I worked up the Three Points – Mt. Waterman Trail toward Twin Peaks and Mt. Waterman. The trail from Three Points is a long-time favorite and part of an adventurous — and scenic — 20 mile loop around Waterman Mountain. In 2009 the Station Fire ran up the ribs and gullies of the south face of Mt. Waterman, ravaging some slopes, but leaving others untouched. Many trees were killed, including some old growth incense cedars and Jeffrey pines. On a run in March 2017 I counted more than 40 dead trees down on the trail. At that time a few trees had already been cleared from the trail and in the following months many more would be. 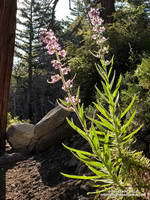 Grape soda lupine along the PCT in Cooper Canyon. Click for larger image. One particularly hard hit area is about a half-mile west of the Twin Peaks Trail junction. Last Summer dead trees blocked the trail in this area and in places were stacked one on top of another. The title photo is of the same area after the trail was cleared. 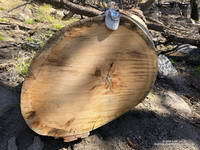 On a previous run I’d photographed the growth rings of a burned Jeffrey pine above the Twin Peaks Trail junction and estimated the total at about 325. Today, a recently cut Jeffrey pine just west of the Twin Peaks Trail looked like it might be considerably older. A very rough count of its rings totaled 475. On this run the Three Points – Mt. Waterman Trail was almost entirely clear of trees and in the best condition I’ve seen since the Station Fire. Many thanks to Alan and the SoCal Hikers & Trail Builders for restoring this trail! Here are a few photos from the run.